← Winners of Finally Home-Finally Found & Paging Project Journal! “This story would not have been possible without the intervention of a rambunctious mutt named Howdy, but let me save this prequel for the end. It’s priceless. My mother, Jean Angley, grew up as Jean Marie Davis in the coal-mining region of northeastern Pennsylvania (NEPA). Born during the Great Depression, and the youngest of 13 children in her Welsh-American family, it would seem misfortune was in her cards. But I think that’s also what made her the bravest, strongest woman I’ve ever known. My dad was from a large, Irish-American-Catholic family, and after working as a coal miner in the 1940s, he and his new bride moved to New Jersey where he pursued a job in a leather tanning factory. When my mom was pregnant with me in 1959, already the mother of four other young children, one of whom was still an infant, my dad suffered a stroke. The only good thing it seemed about living in the Projects in Newark, NJ, was its proximity to New York City…and Columbia Presbyterian hospital. My dad was rushed across the Hudson River and into the operating room. Brain surgery in the 1950s was nowhere near as refined as it is today. Back then, most people died on the table. The surgeon told my mother as much. I can only imagine her fear, the mother of four, with number five on the way, facing the loss of her husband and the sole breadwinner who had no life insurance. I’ve heard tales that my dad was the very first person in the history of medicine to have survived this particular operation. But he was not out of the woods yet. He was in a coma for three months, and when he finally came out of it, he was permanently paralyzed on the right half of his body. All the while my dad was in the hospital, my mother made the trip back and forth between Newark and NYC by bus, visiting with him and praying for him. Throughout all this she not only had to care for her four children, she also gave birth to me. It was tough, and while I was too young to even be aware of what she endured, I often think about how she must have struggled through it all. My dad pulled through and continued to work hard every day of his life until his death in 1985 from Black Lung Disease that he developed during his coal mining days. Although my parents never finished high school, all five of their children have college degrees. Today, my mom remains my heroine…a tough old gal with a great spirit and endless love. 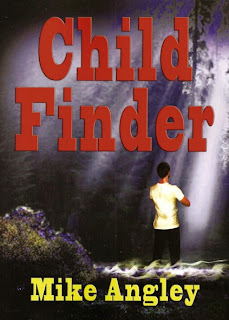 Mike Angley is the award-winning author of the Child Finder Trilogy. He retired from the Air Force in 2007 following a 25-year career as a Special Agent with the Office of Special Investigations (OSI). …inspired by real-life experiences… follow the paranormal adventures of an Air Force Special Agent as the government exploits his psychic abilities to rescue abducted children. Major Patrick O’Donnell, an Air Force Special Agent assigned to the Pentagon, begins experiencing haunting nightmares about children who have been abducted and murdered—before their bodies are found. It quickly becomes apparent that he has a special psychic gift that the government is all too eager to exploit. He is drawn into a TOP SECRET black world community overseen by the FBI that leverages his skills to solve child abductions. Soon Pat discovers that this black world has an even darker underbelly when those close to him begin to die mysteriously. Rescuing abducted children is a noble pursuit, but it comes at great cost. Pat must battle dark, murderous forces within his own trusted inner circle, as well as unimaginable evil that threatens his family. Before his journey ends Agent O’Donnell will learn explosive government information that will rock his understanding of life, the universe, and his own faith. Perhaps some secrets are best kept hidden . . . I appreciate the kind words…my mom is my real heroine as I mentioned, and her strength in life is what inspires me every day. I was happy to have Mike as a guest. Great story! Great post Michael! Your book sound like a fabulous and I would love to read the series. Thanks so much for sharing with us! Wow….great post, Lyn! Mike, this was so interesting! Thanks for agreeing to come on and thanks Lyn for having Mike! Great post. This book sounds great. Tnanks.